Remove silver skin from tenderloins, leaving a thin layer of fat. Combine brown sugar and next 5 ingredients in a large zip-top plastic freezer bag; add pork. Seal bag, and chill 8 to 18 hours, turning bag occasionally. Remove pork from marinade, reserving marinade. Preheat grill to 350° to 400° (medium-high) heat. Grill pork, covered with grill lid, 8 minutes on each side or until a meat thermometer inserted into thickest portion registers 155°. Remove from grill, and let stand 10 minutes. Meanwhile, combine reserved marinade and cornstarch in a saucepan. Bring to a boil over medium heat; cook, stirring constantly, 1 minute. 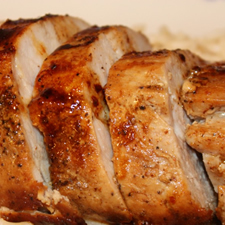 Cut pork diagonally into thin slices, and arrange on a serving platter; drizzle with warm sauce. Per Serving (4 ounces): 192 Calories; 4g Fat (22.4% calories from fat); 1g Saturated Fat; 25g Protein; 8g Carbohydrate; trace Dietary Fiber; 74mg Cholesterol; 456mg Sodium. Exchanges: 0 Grain(Starch); 3 1/2 Lean Meat; 0 Vegetable; 0 Fat; 1/2 Other Carbohydrates. Per Serving (5 1/2 ounces): 256 Calories; 6g Fat (22.4% calories from fat); 2g Saturated Fat; 33g Protein; 11g Carbohydrate; trace Dietary Fiber; 98mg Cholesterol; 609mg Sodium. Exchanges: 0 Grain(Starch); 4 1/2 Lean Meat; 0 Vegetable; 0 Fat; 1/2 Other Carbohydrates.